The Gustavus gymnastics team posted a season-high 183.825 team score in a WIAC dual meet Saturday at UW-Eau Claire, who scored 185.100. 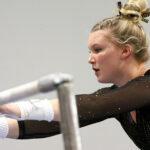 The Gustavus gymnastics team Saturday took third at a triangular hosted by UW-Whitewater, scoring 180.525. 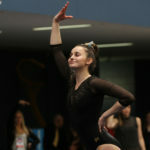 UW-Whitewater won the meet with 183.375 points and Winona took second with 182.650. 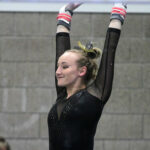 The Gustavus gymnastics team won a WIAC dual Tuesday at Winona State by a score of 180.275-178.725. 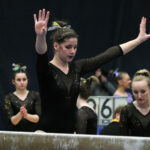 The Gusties also took first place in all four events as well as the all-around. 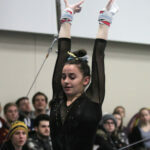 The Gustavus gymnastics team Saturday dropped a WIAC dual meet 183.825-179.450 at UW-Oshkosh. 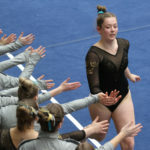 The Gustavus gymnastics team Saturday started its 2019 season, taking fourth at the Best of Minnesota Meet at the University of Minnesota. The Gusties scored 182.175, which is the highest team score in the first meet of the season in program history. 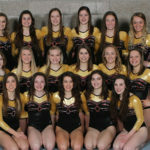 The Gustavus gymnastics team is set to kick off its 2019 campaign 4 p.m. Saturday at the Best of Minnesota Meet, hosted by the University of Minnesota. The meet features the only four collegiate gymnastics teams in the state of Minnesota – Gustavus, Hamline, Winona State, and the U of M.
The National Collegiate Athletic Association announced the team and individual competitors for its Women’s National Collegiate Gymnastics Championships and Gustavus’s Amanda Malo (Jr., Greenwood, Minn.) has been selected as an alternate in the all-around competition at the Minneapolis regional, which will take place 4 p.m. April 7 at the University of Minnesota. The Gustavus gymnastics team opened its 2018 campaign Saturday with a Wisconsin Intercollegiate Athletic Conference dual meet against UW-Eau Claire at the Sponberg Gymnastics Studio. The Gusties lost 181.275-175.8. The Gustavus gymnastics team kicks off its 2018 season this Saturday, hosting the University of Wisconsin-Eau Claire at Sponberg Gymnastics Studio. Entering her fourth season at the helm, Head Coach Aryn DeGrood returns 15 gymnasts and welcomes five first-years to this season's squad.